On January 31, 1995, I wrote a letter to Carl Munck explaining my dream and the "Gematrian Wheel" that developed from it. I covered some of this in Part One of this series of articles. Many months passed by, with no response from Carl. I felt a bit deflated, figuring that Carl did not see much significance in the idea. Later, I heard that Carl had a heart attack, and realized that was probably why he did not respond. On July 31, 1995, I received "The Code" newsletter #4-95, for August/September 1995. The first article on the front page was titled, "DREAM MATH . . ? ?" To my surprise and delight, Carl had published the letter I had sent five months prior. As I read Carl's response to my letter, my heart began soaring with Carl's glowing words of approval and brilliant explanations concerning various elements in the "Gematrian Wheel." I count that day as one of the highlights of my life. This article will review the letter I sent to Carl, and his response in the newsletter. I explained the Gematrian Wheel in Part One of this series of articles, so some of this is repeated here. But, there are some additional parts, and my explanation is somewhat different than in Part One. The graphic of the Gematrian Wheel is displayed again, for convienience. Thanks for the latest "CODE." I hope you are recovering quickly from your illness and that you will bounce back with renewed vigor. Something new came to me recently involving geometrics that you may find interesting. I had a dream where I saw a circle with a shaded area, like this . . . I knew this was about gematrian numbers. I associated this with previous dreams suggesting that our universe is generated from another. Simple diagrams of generators show how a sine wave is generated from wires crossing magnetic fields . . . Being a comparative dunce in mathematics, I drew a circle and punched up tangents of various numbers, trying to see how the system is laid out. It seemed a bit odd that zero tangents are found at the top, bottom, and sides. Figuring a 360 degree circle, it came out like this . . .
Any multiple of 360 that ends with .1 through .9, with the exception of .5, is a Gematrian type number. The numbers are repeated with a factor of '10' on full revolutions (360, 720, etc.). Perhaps the biblical number 144,000 was derived from 400 revolutions on the Gematrian 'Wheel'. The 1260 days of Revelations 11:3 is not a Gematrian number, but falls on the 180 degree mark, and 3.5 is the multiple, matching the 42 months (3 1/2 years) of Revelation 11:2 and the 3.5 days of Rev. 11:11. 666 is also not a gematrian number, but falls exactly between 1.8 (648) and a 1.9 (684). The 90 degree and 270 degree marks also fall half way between two Gematrian points. Other geometric shapes may be suggested in the design, such as the 180 degrees of the triangle and the 720 degrees of the tetrahedron. [by adding the degrees of the surface corner angles]. I felt that coincidence was at work here. In my letter to Madelon (Rose Logue) which she sent to you, I asked about the significance of '10', because of the two crop circles (the Bythorn Mandala and Spider Web). You responded by informing me that '10' was the base harmonic of the planet earth, found at its very core. 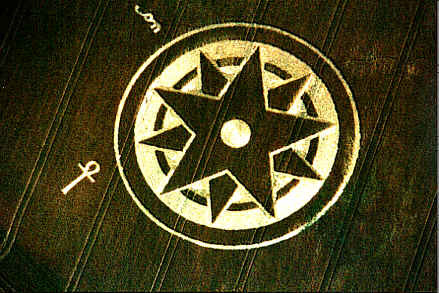 Coincidentally, the Gematrian 'Wheel' suggests a circle divided into '10' parts, matching the two crop patterns. Is this an accident or a meaningful coincidence? I tend to agree that the ancients did not fully understand the numbers they were using. My theory is that it came from dreams or dream-like states. In that realm we are collective, so physical contact is not necessary in coming up with the same numbers and ideas, and you need not fully comprehend their meaning. An astute observation to be sure! Why did I not think of that? Maybe it's time for a new science - dream archaeology?? When we stop to think about it, it makes sense . . .
What CAUSES dreams? Without question, certain stimuli seems to activate certain types of dreams . . .
Before my psychic gift was erased while upon Cobble Knoll, a good 90% of my own dreams of future events occurred during the months of November and March - and they were always 80 - 90% accurate. Were they caused by changes/fluctuations in earth energies resulting from the sun's movements in the lower latitudes? . . . As the earth spins inside it's magnetosphere 'motor'?? Since Cobble Knoll, however, no more information has been forthcoming. Today, my own dreams make little sense, probably owing to the chemical medications the medics have had me on. Could the ancients have mastered also the art of generating certain types of dreams or dream states via certain herbs, dreams that could put them in closer touch with Creation's master plan? If not dream-archaeology then perhaps medical archaeology? Let's see now . . . I seem to recall that the Lotus flower was big in such ancient lore . . . Aroma?? Taste?? Hmm . . .
Then again, who needs it? The heart of it all derives from mathematical law, and math can be read like a roadmap once one becomes familiar with it, I think we could actually provide it with a definition beyond the vague one which has managed to survive the many centuries since it was regarded as a high science. Shall we give it a shot? One of mankinds oldest axioms specifies that absolute power corrupts absolutely. We need not look far today to find prof of it either. There is another axiom which follows this one albeit it is rarely heard: Corrupted power cannot coexist with truth. The hierarchy of the ancient priesthood was painfully aware of them both and it was one of the reasons (if not the primary) why they did not commit the Pyramid Matrix to writing. When knowledge collapses, what follows? Weighing rubies before knowledge is what brought Atlantis down and God alone knows how many other nations and systems on our side of time. It's the price we must pay for corrupt leadership, for when systems fall, ignorance feeds emotion, fanaticism follows and the walls come tumbling down everywhere. It's the way people are when knowledge wanes. So have we here the high priests of remote antiquity. Having carefully arranged this global matrix system, they had no choice but to reject the idea of writing it down on any parchment for fear that it would be destroyed by any or all of the 'leaders' who would follow. Control of the mass mind can not be favorably achieved if a better truth is available. But, how to keep THE CODE alive in the midst of chaos . . . ? 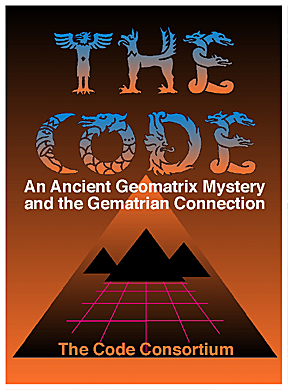 THE CODE, with all of its maps, it's irrational numbers, like pi and the radian, its sacred sites and all the rest. Simple: Reduce it to easily remembered rational numbers. The 360-degree circle is forever, so devise a simple Base Ten System which breaks the the 360-degree circle down into smaller numerical units of 36, 72, 108, 144, 216, 252, 288, and 324 (numbers which HOLD only two common tangents) and 90, 180, 270, and 360 (which have zero tangents). KEEP THOSE NUMBERS ALIVE AND THE CODE WILL NEVER DIE. Because in time, the pi ratio will again be found in the Great Pyramid. When it is, gematria will enjoy a rebirth - automatically - because it is INTEGRAL TO THE CODE. Observe what happens when these base gematrian figures from Joe Mason's 'dream-circle' are exposed to the Great Pyramid's key - the pi ratio - 3.1415926535 . . .
See? These 'sacred' gematrian numbers are natural links between pi and the various aspects of the radian. Since pi and the radian comprise the very heart of the pyramid Matrix system - as explained from Giza to Chichen Itza to Cuicuilco - the decoding process is once again possible. We can extract even more data from Joe's circle by further reducing these figures by Base Ten, for example, '36' can be reduced by ten to 3.6. Give that to pi and we are instantly propelled back to Giza . . .
Once we have that, simply apply the basis of our numerical system itself (1.11111111) and we find . . . I have had that irrational in print for a dozen years now - as the TANGENT of the Great Pyramid's slope angle. The rest is academic: Gematria directly links up with THE CODE. There they are - EVERY ONE OF THEM!!! As for those tangent-less quantities of 90, 180, 270, and 360, they too figure into the plan . . .
2/5 Radian (22.9183118) is revealed at Tikel by Temple I - whose West Giza longitude is 120 degrees 45 minutes 22.9183118 seconds. (3) The C.I. of Florida's Mound Key complex. 4/5 Radian (45.83662361) The Teotihuacan Constant (See THE CODE-1995), page 154). Radian (57.29577951) The Matrix C.I. of the Kukulkan Pyramid at Chichen Itza, Mexico. Joe gets this material through dreams, so be careful when negating the value of one's dreams. I have to envy his gift because I have to do this stuff the hard way. Interesting, is it not, how it all comes together for a PERFECT FIT. While new to Joe perhaps, the tangent values, 0.726542528 and 3.077683537 are 'old hat' around here and I have been through it before. For those who might have missed it, notice that the tangents on Joe's circle share both plus and minus values. What do such opposing numbers suggest? A simple table for sine waves . . .
We can do exactly the same thing with his other numbers 36, 144, 216, etc. all of which share plus/minus tangents of 0.726542528 . . .
Gematrian numbers therefore are no longer a mystery. Now we see why they HAD to be: they encoded tangents which were VERY well ordered. Well, it all makes very good sense, but how are we supposed to use it over here on our side of time? To what must we apply it? The global matrix, of course. I will explain it in better detail in a future CODE annual, but in brief, the positioning of these ancient pyramids and allied earthworks present us with mathematically arranged "KITES" which guide us to certain important 'holy' sites known by these long lost people. Among them is a place we know today as Warm Mineral Springs, Florida. 27 degrees 03 minutes 35.09" N.
Notice that the matrix C.I. of Warm Mineral Springs is a mathematical constant in that its value exactly equals 3/5ths of 57.29577951 radian deg. Is it only coincidence that the C.I. or this body of water, with its reported healing properties, replies to the geographical positioning of some of our largest aboriginal monuments? Or could it be that this powerful natural spring was considered to be of such importance to the ancients that it was PART OF THE REASON WHY the Pyramid Matrix was arranged in the first place? A direct link with the gematrian realm! Pi, 2 pi, 3 pi, 4 pi, 5 pi, 6 pi, etc. MORE gematrian numbers, stacked up like cordwood. What do they show us? Apply them to their respective SINE charts, for example the one shown previously. Notice that we have a completely new sine wave. A second new sine wave flows from the first scale (tan. 3.077) peaking at 108, 432, etc. Since sine waves are most generally indicative of energy waves, might these not indicate THEIR way of READING the natural energies at Warm Mineral Springs, hence, THEIR way of TRANSMITTING ITS DATA TO US! The math certainly suggests it. The gematrian sacred numbers, pi, WMS'S C.I. in the Matrix and our own basic numbers, 1, 2, 3, 4, and so on. They have furnished everything we need to put the puzzle together. All we have to do it apply it. One other truism I should mention here concerning our basic numbers is that not only do we find them encoded at Giza, but elsewhere besides, for example, over at Stonehenge in England. There is such to be learned there when one is careful to pay attention. The stoneworks at Stonehenge, as we know, represents the THIRD stage of construction at this site.The first stage of construction was the great circular earthworks and all the so-called "aubrey Holes". These survive today as depressions in the ground where the buildings once stood 58 large logs on end for something we moderns like to refer to as a 'WOODHENGE'. As we know, 56 of these poles comprised a great circle at the inner face of the banked earthen circle. We can see that, so it's true, right? Of those 56 postholes, only 54 stand next to the earthen bank itself. 4 others stand in the open, clear of the earthworks. We can find the pattern for our base number system again, over at Newark, Ohio. Again, it comes from an ancient earth-circle, namely, the one which is attached to the great Octagon. As seen in the CODE 1994, the GRID Longitude of this circle is 216,000, but, there were no postholes in Newark's earthworks, so what are we to 'count'? If we can't find postholes to count, count something else. In the case of Newark, apply the earthworks themselves. What does the Octagon show? 3. And a walled 'avenue' which joins them. It's GRID latitude is 887.6223994, the square ROOT of 787873.524. 787873,824 CUBIC DEGREES is the volume of any 3600 degree SPHERE. A mathematical constant, one which clearly heralds in the RADIAN to the decoding process. R = 57.29577951. That becomes the second factor required for our formula. Since the radian cannot be revealed without the help of the pi ratio, pi becomes our 3rd element. The 4th and final element, of course, is most obvious as the 360 degree earthworks itself. And there we see it again, the 'root' of all our numbers. We have underestimated the Hopewell's who are believed to have built this display. They were pretty sharp people, and it is NOT coincidence. the KNEW squares and square roots inside out; we can see it in the printout of the circle's GRID Latitude here.. The older hands will recognize it in a glance...As the SQUARE of...2.719715671,,,FEET...the so-called Megalithic Yard! So, Joe, you keep right on 'dreaming' your math. If anyone gives you any static about it, shove this under their eyes. I've had it all mapped out here for years. It is verifiable.! Joe's 'dream' math...Where does he get it from? Is there some cosmic input at work today which is manipulating - or programming - some of us in new directions? I have asked myself that question time and again as I ponder what is unfolding before me, before certain others. I have had to . . . When new management took over my former love, the Delaware & Hudson Railroad, the personnel cutbacks were furious. My lack of seniority soon squeezed me off the bottom of the Extra Board and I found myself out on the street. That's no fun when you are 48 years old and living in Endsville, U.S.A. where there is no meaningful work. "My God, what do I do now?" "Yeah, right. Get lost. I'm going fishing.!!! Well, it kept coming, night after night after night. One hasn't suffered cosmic inspiration until one has tried to sleep through such a mental bombardment for a few weeks. There's only one way to get out from under it: Give in. After all, who are we mere mortals to argue with the REAL Head-shed? So, I did it. Today I have THE CODE. What 'force' was it that kept Hannah pouring over gematria for most of his life when he was unable to make sense of it? But he kept at it, waiting for me to come along as it turned out. THE CODE proves to be the missing link he was seeking to this 'lost science' of antiquity. Why does Bill Cote (B.C. Video, N.Y.) continue making videos of ancient sites when there's so little $$$$ in it? He must know he could make more shooting skin flicks and the other garbage that is so desired in our sick society. Obviously, it is HIS calling. But who 'called'? Why does Richard Hoagland devote his time to the MARS MISSION when, gifted speaker that he is, he might have been the highly exhaulted Speaker of the House? Enormous talent that has been somehow 'directed' along a very different path. Why does Colette Dowell, a struggling girl haunted by unusual experiences, so devote her time and sparse funding to the investigation of crop glyph phenomena? Why does Madelon Rose Logue continue to map out magnetic anomalies when the establishment couldn't care less about the subject? Why does Art Hayward and Bodo Capeller and Dr. Richard Clark continue to look for those doorways to other dimensions when they can't find a nickel's worth of funding to help them along? There is something beyond our own experience guiding some of us - even pushing us - and w are powerless to deny it. It is a force for truth and the quest for it in this world of lies and deception, like a last ditch effort to sustain mankind toward what it CAN be when rid of all the ignorance and suppression which has held us all under its heel over the ages. As THE CODE now reveals, there was once a better way. Must be it's up to the likes of us to find it - once again? Many are 'called', but few are chosen. "Sufis have used perfume to create etheric visions. Mohammed himself was very fond of perfume. A particular perfume can create a particular dream." In eastern religions the Lotus flower is associated with the chakras. Interestingly, the word "chakra" means "wheel." The ten-petal Lotus, such as the 1993 Bythorn Mandala crop formation, and another that appeared in 1998, represents the third chakra. As I mentioned in Part One, the symbol also seems to represent the time cycle we are in, the Kali-Yuga, or Age of Iron. I learned some of this in 1997, while researching and writing an article about the theory that many of the crop formations represent the chakras. Also interesting, the number associated with the seventh, and highest human chakra is 972, which is a Gematrian number. In my theories, the harlot of Revelation 17 corresponds to Kali. The harlot is associated with the "ten horns," in Revelation 17:16. Perhaps this suggests a Gematrian Wheel, as each of the "wedges" of the "pie-like" design could also be horn-like shapes. Some say the "New Age" is associated with a "higer vibration." Could it be that the creation in the time cycle is similar to a generated vibration, and that this will change to a new vibration in the next cycle? The next cycle seems to be related to the number 12, such as the crown of twelve stars worn by the Woman With Child in Revelation 12, the twelve gates/angels/pearls/jewels of The New Jerusalem in Revelation 21, and to the idea of a leap to the heart chakra level. The heart chakra is symbolized by a 12-petal Lotus flower, with a Star-Of-David-like design inside. Of course, the number 144000 is in Revelation too. It also has a "12" connection, because it is 12000 people from each of the 12 Tribes. 12 squared is 144, a Gematrian number, and 12 to the third power is 1728, another Gematrian number. In a future part of this series of articles, I will present the "Twelve-Part Wheel," and the numbers involved. Near the beginning of July 1998, a ten-pointed star appeared.